I'm working on replacing my current Mini 1012 motherboard (which has only 1 mPCI-E header) with the motherboard that has 3 mPCI-E headers - 1 being used for Wifi, 1 being used for Broadcom, and 1 empty slot. Then I would simply buy an IPX to MMCX cable at the correct length. I'd drill a hole large enough for the MMCX port to go through - between the USB and SD card reader on the left side - and I'd probably have to superglue the MMCX port to the inside of the chassis or something. Does anyone know if there is even the slightest possibility that this would work? Last edited by TwistyTravster; 02-22-2016 at 02:27 PM. you should first weld a mini pci-e connector to the MB using a soldering iron. make sure its the correct hight to prevent damage to the cards in it. make sure you take your time doing this the connectors seems like they are already have tin on them, so placing a connector and use a soldering iron or gun to heat up the tin to make the connector to the MB. then test all connections with a multi meter. before you use the tuner find out if its a DVB-T, DVB-C, DVB-S or a combined one. for getting extra space you can try using a half lengt SSD for storage, this way you have excess space for any other projects. I am not soldering mPCI-E headers. I am buying a new motherboard with the headers already on. I said that in my post. This is the motherboard I have already bought and will be replacing my current one with once it arrives. I am pretty sure this card is for ATSC. The issue with that would be the inconsistent standard being used between mSATA and mPCI-E. The pin connectors may not be compatible, even though they are physically identical, because certain manufacturers do things in different ways. I wont know for sure if a mSATA SDD would work on my mPCI-E headers until I actually try it. 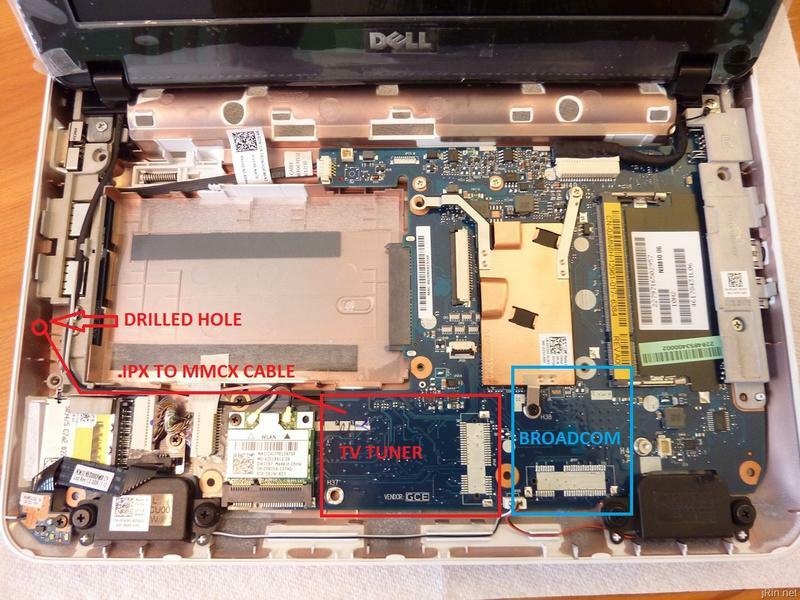 Dell is especially known for causing all kinds of problems with proprietary hardware, which makes it even more of a wild card. Even if it wasn't proprietary, mSATA devices will only work on mPCI-E headers if there is a SATA controller attached to it. Last edited by TwistyTravster; 02-23-2016 at 04:24 AM. Does the stock cooler not already have thermal pads installed on it? some do some dont, you can buy extra wich is sometimes better with passive cooling. Last edited by darknessblade; 02-26-2016 at 08:35 PM. I think I'm going to give up on this idea. It seems to be more trouble than it is worth. Plus, in my area, there are very few OTA channels to begin with. However, I have plans to make the ultimate Dell Mini 1012! I will update with a new thread once I have everything I need. Future mods include: Remix OS, a/b/g/n/ac Wireless, Dual Bluetooth (3.0 + 4.0), Broadcom HD decoder, Resistive Touchscreen, Palmrest/Touchpad Mod, and possible eSATA or HDMI output. I plan to use it to stream movies to MX Player and stream ROMs for Android emulators from my DLNA server. I love the idea of playing any game console ever made up to N64 on the 10" screen. I might get some USB controllers as well. Or I could use Moonlight to stream full quality 720p 60fps Steam games from my Gaming PC. Last edited by TwistyTravster; 02-28-2016 at 02:57 AM. they also have a ebay-shop. they have loads of parts (refurbished) at minimal cost. i gotten my 2nd panel there for less than 5$ including shipping. you can get more types of modules, and add those to your netbook. wich has a half size, thus meaning you can add more stuff in the hole by the hdd. you cab 3d print a casing for the ssd so its more safe. I plan to use an SATA SSD 120GB. I may use a 60GB instead, but I haven't decided. I need the extra mPCI-E slot for something else. However, I may need to use a half SATA card instead, due to space limitations. But if the full SATA SSD is slim enough, I may have space on the top of it. And this is the touchscreen panel I am going to be using with the above card. It will avoid most of the soldering, hopefully. I may have to cut and solder wires for length, but that should be about it. Last edited by TwistyTravster; 02-28-2016 at 01:24 PM.